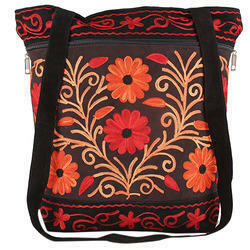 We present kashmiri embroidery bag for you to add zeal to your party. If you don't use leather here we have bags from kashmir cloth for you with hand embroidery work. We are a well-known company that is engrossed in presenting a comprehensive array of Kashmiri Ladies Bags. Conform to industry norms, our provided bags are crafted under the firm guidance of adroit professionals utilizing quality leather and latest machinery. 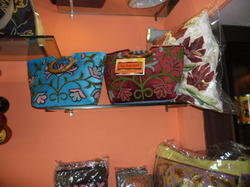 Kashmiri bags are world famous bags.these bags are made in kashmir with kashmiri embrodiery.